Engage and Retain Your Staff Members and Volunteers with Recognition Awards! The Great Recession of 2008-09 severely restricted the availability of funds for nonprofits. Numerous foundations and public institutions have turned to Awards Network for recognition and incentive program solutions to overcome retention and engagement challenges while remaining within budget. 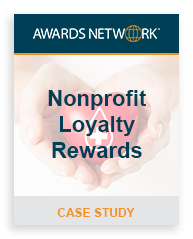 Awards Network has assisted nonprofit organizations in designing and implementing recognition programs that award employees and volunteers on their anniversaries. In addition, some nonprofits have utilized incentive programs to increase charitable responses, and foster engagement and loyalty in the workplace. A nonprofit blood bank asked Awards Network to develop an online incentive program that would serve to engage and retain both employees and volunteers. Awards Network created and administered an online incentive program for the blood bank. The online award program served as a central hub for communication between the organization, employees and volunteers. When accounts were updated, new goals introduced or an organizational milestone reached, users were notified via opt-in email updates. Each user was given a unique username and password to access the program website and could log in to view the incentive program goals, gifts that could be earned and leader board reflecting the program’s top point earners. Employees and volunteers could earn points to spend right away or opt to bank the points earned to spend at a later date. Managers and employees could also visit the website to submit peer to peer recognition nominations. For example, when an employee or volunteer worked later than scheduled or came in to work on a day off, managers and co-workers could formally thank the person via the incentive program website. The intangible results of the online incentive program included having more engaged employees and volunteers, better collaboration and teamwork and the nonprofit was able to foster a culture of recognition in the organization. Do you need an expert to help your organization retain and engage employees and volunteers? Contact Awards Network today to discuss your incentive program needs.